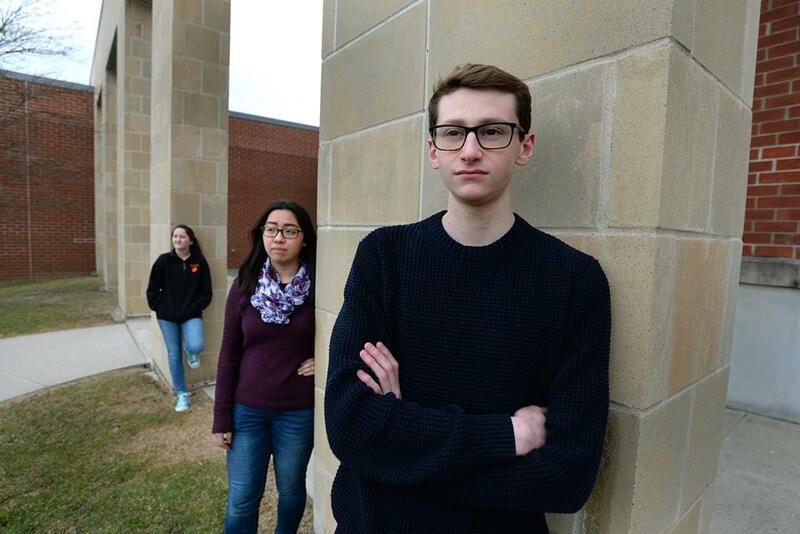 Oliver Ames High School students (left to right) Victoria Thomas, Hannah To, and Andrew Abramson are planning a school walkout against gun violence March 14. When an unexpected fire alarm went off a few weeks ago at Dedham High School, Julia MacLean, a sophomore, thought of the Parkland school shooting where, on Feb. 14, 17 students and teachers were killed by a gunman who reportedly pulled the fire alarm to draw the victims out of their classrooms. While she feels generally safe at her school, MacLean said it surprised her to even have to consider the fact that a shooter might be behind an otherwise routine drill. “It scared me because I never would have thought that two years ago,” she said. Now, she is organizing a March 14 walkout at her school, joining students at thousands of schools around the country who want to stop gun violence. They are riding a new wave of activism and advocacy that many observers say feels different and potent because it is driven by teenagers. “The youth is really rallying together and recognizing just how much power we have, just how much ability to effect change we have,” said Aidan Murphy, a junior at Quincy High School who is organizing a walkout there. Students at schools around the nation, including many in Boston’s suburbs, will leave their classes for 17 minutes beginning at 10 a.m. Wednesday to honor the 17 victims gunned down at Marjory Stoneman Douglas High School in Parkland, Fla.
At Oliver Ames High School in Easton, students will walk around the school’s track for 17 minutes. At the high schools in Quincy and Mansfield, participants will listen to student speakers talk about gun control. At Dedham High School, students will hold signs and wear orange, the color associated with gun violence awareness. Those actions follow other protests that have already taken place in Boston-area schools. More than 400 students at Cambridge Rindge and Latin walked out last Wednesday morning, many holding signs with messages such as “Silence = Complicity.” Students in Arlington, Medford, and Somerville have also held walkouts. While all of the demonstrations advocate for common sense gun reform, many are not focusing on specific policies, in order to make their event inclusive for people who want to honor the lives lost in Parkland but may differ in the specific gun control policies that they support. “The thing that I am trying to keep in mind is that a lot of kids are coming for different reasons, so we’re trying to keep it a general call to lawmakers to make school safety a priority,” said Paige Oliveira, one of the students organizing the walkout at Mansfield High School. The Women’s March organization’s youth branch, Empower, which is spearheading the March 14 walkout nationwide, calls for policies such as a ban of assault weapons and high-capacity firearm magazines and an expansion of background checks to all gun sales, and opposes arming teachers with guns as advocated by President Donald Trump. Students organizing the walkout at Oliver Ames also plan to host a gun-related forum moderated by teachers after school sometime in the week leading up to the “March for Our Lives” rallies planned in Boston and other cities around the country on March 24. “We wanted to plan to get people talking about this more in an open environment so people can express any views they might have,” said Andrew Abramson, one of the student organizers at Oliver Ames. While administrators at the school will not express their own opinions on gun control, they say they support the students’ political engagement and will supervise the event. Students at Oliver Ames will not be punished for participating in the walkout. “In this case, it’s a teachable moment and an opportunity to show the students that we get their frustration and we support their way to show their frustration,” said Wes Paul, the school principal. Students at Mansfield High who participate peacefully in the walkout will also not be disciplined, according to an e-mail to members of the school community from principal Mary Watkins. Students at Norwood High will be given a cut slip if they participate in the walkout. Universities such as the Massachusetts Institute of Technology, Boston University, and University of Massachusetts Amherst, meanwhile, say students who are disciplined in anti-gun violence protests will not be negatively affected in the admissions process. Student organizers say that the response among their peers has been overwhelmingly positive, even if not everyone supports tighter gun control. “I’ve heard of people obviously who don’t want to do it, but the point is to spread awareness for the issue instead of getting everyone to leave the school” in a walkout, Abramson said. Many of the event planners said they were inspired to organize a walkout at their own school after seeing students from Marjory Stoneman Douglas High School speak about gun violence on the national stage.